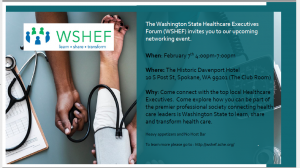 The Washington State Healthcare Executives Forum (WSHEF) invites you to our upcoming networking event. Meet-n-Mingles are informal gatherings of area WSHEF members. There is a small fee to cover appetizers. While this is not a formal education program, someone will be there to share upcoming WSHEF and ACHE events and activities.